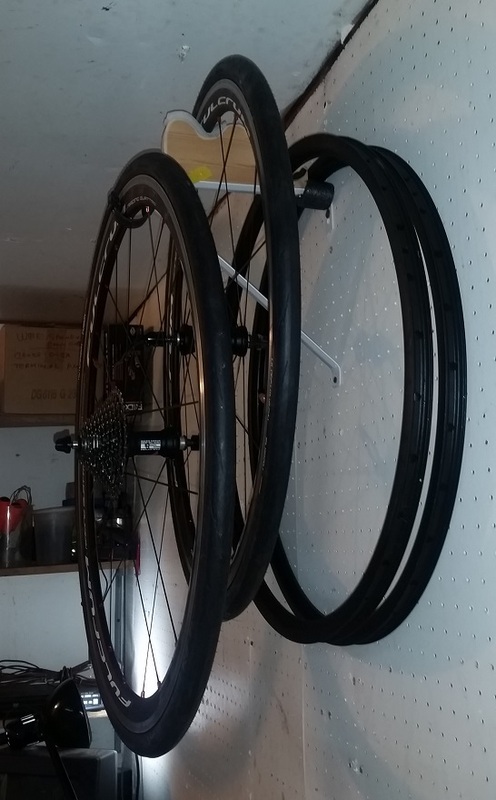 CYCLINGFORUM.COM -- View topic - DIY Wall wheel rack. 2/21/19 11:54 PM DIY Wall wheel rack. After tossing the design around in my head for 3 minutes. I did a Home Depot run. Going to do 5 altogether. After mounting 3 today I realized I could fit two more lower on the wall centering one below the top left two, and two right respectively. Home Depot closet shelf support, a scrap piece of pine, some pipe insulation, and some old tire tube. I was shooting for 3 wheels per. But find two rims and one pair of wheels fit nice and non crowded. The pipe insulation on the wood to ward of scratches. The tube is on the metal front hook that is made to take the closet pole. The pine raises the 2nd wheel in so the hub of the outside wheel is well below the the center of the inside wheel for offset. The pine has two levels for the rim to rest. But I noticed I could sit 2 rims and two wheels better than 3 wheels as I noted. Due to the angle of the bottom support hitting spokes on the wheel closest to the wall. The wood looks kinda like a guitar (what did I expect?). Wheels are inherently tricky to store into small amounts of space. That looks like a good and cheap way to exploit wall space. I've zip-tied wheels together in pairs or even four wheels, somewhat in a layered fashion keeping the hubs offset from each other. Then to be hung from hooks sliding on a metal pipe. 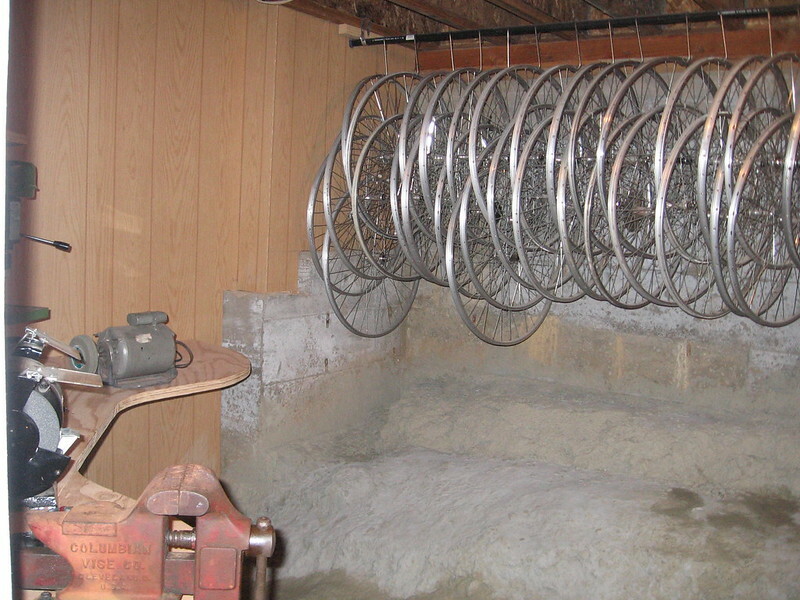 Was a good use of "useless" (tapered and shallow) basement crawl space. Your method is normal old school LBS fair I have seen many a time. If I was you, I'd cover the block and surface under your wheels. All that will continually sweat H20 vapor. Any oxidation dots forming on your alloy there I wonder? Got a hydrometer laying around? Got a hydrometer laying around? Unless you're wanting to determine the density of a water solution with a hydrometer, you're better off using a hygrometer to measure humidity. Must have misspelled and just went with the spell checker choice without actually looking.